Key Question: How are blue holes and the spaghetti harvest in Switzerland connected? Task 1 - Headphones out. Watch the video to the right hand side. What are your thoughts on the plight faced by the Swiss and their spaghetti harvest? What do you think about this video? 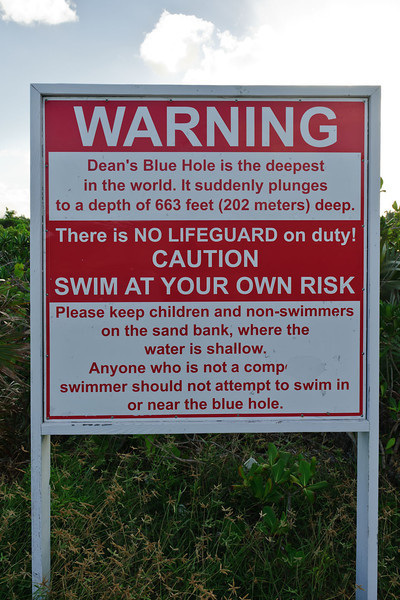 Task 2 - Where is Dean's Blue hole? Click here to find out more about this place. Make some notes on its depth, formation and location. Look at the sign below, what are the dangers? Would you swim there? Task 3 - Base jumping to the bottom of Dean's Blue Hole. Watch the embedded YouTube video to the right hand side. Task 4 - Is the film is a work of fiction? Come up with a list of questions that will help you to find out if this video is real or not. i. What is the record for breath holding? ii. How long is the film clip? Task 5 - Find the answers to your questions on the rear of the worksheet. Plot on the diagram how far you think Mr Nery descended to. He appeared to hit the bottom? So can we believe everything we see and hear? Nosy Geographers have to be careful not to believe the first source of information they read. There are plenty of practical jokes, incorrect and sometimes plain silly information out there. Task 6 - Create a small warning postcard to hand out to Year 7 Geographers about the dangers of relying on one source of information and that contains five good quality bits of advice on how and where to research properly. What are the top sources of Geography information out there? Give a list of the best sites.